The Man Who Loved Children is one of Australia’s neglected classics, even though Time Magazine included it in their 100 Best Novels from 1923-2005. (You can find the rest of them on Lists of Bests). It’s never in any of the bookshops, but I’ve always meant to read it so I was pleased to find a not-too-battered paperback copy of it in the Op Shop last year to read it for the 2010 Classics Challenge (which I like to participate in by choosing only Australian classics). I was initially pleased to find in another Op Shop, a second copy, the Angus & Robertson Classic Edition, because the text was bigger and easier to read. However I furious to find, too late to avoid it, a huge spoiler in the introduction. Perhaps Randall Jarrell, the author of this introduction and his editors at A&R thought that the plot was so widely known that spoilers didn’t matter. Maybe that was so in 1968, but foreknowledge of what happens at the end of the novel has coloured my reading of it and influenced my sympathies for one of the characters. Wikipedia credits Jarrell (an American poet & literary critic) with promoting the book to a wider audience but I’m still very cross about this. Very cross indeed. So I shall do what Jarrell and A&R should have done and alert you to my spoilers with a warning, though nothing I write here will reveal what was so carelessly revealed by them. The title is ironic. Sam Pollit does not love his children at all. This novel is a withering dissection of a dysfunctional family, a story to challenge any Brady Bunch stereotypical ideas about family life forever. Sam is a scientist who travels the world and (at least initially) enjoys the respect of his colleagues; his wife Henny is trapped at home, having babies she doesn’t want, and worrying herself sick about money. Louise is Sam’s adolescent year old daughter by his first marriage; the younger children are a miscellany, and mainly there to create the impression of a brood. Henny and Sam are constantly at war, haranguing each other about everything and anything – and mostly using the children to ferry their poisonous messages to each other. The first time we encounter Henny’s violence comes as a shock, and Stead wastes no time in revealing it. In Chapter 2 Louisa has been reading late at night and Henny comes in to harangue her about lights blaring. Her verbal abuse is bad enough, but when she ‘rushed at her with arms outstretched and thrust her firm bony fingers around the girl’s neck, squeezing and saying ‘Ugh’ twice‘ it is Louisa’s lack of reaction which adds to the horror. She ‘looked up into her stepmother’s face, squirming, but not trying to get away, questioning her silently, needing to understand, in an affinity of misfortune’. The child is used to being attacked like this. More horrific still is that Sam, her father, witnesses all this from the window outside, and yet when he enters the house he is merely peeved that Louise hasn’t stayed up so that he can brag about his triumph at work. Is anybody reading this novel now? Not if the blogosphere is anything to go by. I found a terrific review at Clarissa’s Box, and there’s some scholarly writing at one of those impenetrable academic sites that you can’t read unless you subscribe. (Why don’t they offer access on a one-off Pay Pal basis for a peppercorn fee so that you can read just the article you found through your Google search, eh?) Jonathan Franzen was re-reading it at the same time as me and makes an impassioned albeit pessimistic case for it to be more widely read. But apart from that, there’s not much enthusiasm about. The irony is that she’s adopted the same pattern of ‘gassing’ herself. Louisa (said to be modelled on the author herself) is the most interesting character. As intermediary between her warring parents she is often caught between them but she also takes sides because she doesn’t understand how she is being manipulated. At school she becomes the ringleader of a bizarre cult in adoration of one of the teachers and has precocious talent as a writer, but like her strange father she uses invented language and a kind of baby talk (the profusion of which is the most irritating aspect of this book). Louisa is the only one who ever seems to have any conception of other people’s feelings, but is also pathetically unaware of the spectacle her family inflicts on the appalled Miss Aiden. As the story moves towards its ghastly climax, Ernie, the eldest boy emerges from the undifferentiated brood. Young as he is, he has more awareness of the family’s perilous finances than the adults seem to have, and his small initiatives have resulted in a money-box with a few dollars in it and a collection of lead which can be sold when the price is right. In different ways his parents sabotage his plans and break his heart when he realises he is powerless and insecure; the scene with Henny is a coming-of-age moment to break a reader’s heart too because to Ernie, life seems just as hopeless as it does to her. There is, as DKS says below, a beaut review of this book at Nigeness, and I recommend you follow the other links from her comment, and the links in comments at Nigeness too. Source: Personal copy. $3.99 from the Salvos Op Shop. Lisa, I am sorry to read that this book didn’t live up to standards (thanks for the spoiler alert, I’ve not read it, so skimmed). And, as a general rule, I never read an introduction before the text – there is always a presumed knowledge of the text by these writers. I do have the penguin edition (also from a second hand shop) of the text, but may leave it for a while longer before I read. If you are interested, I also have second hand copies of ‘The people with their dogs’ and ‘Letty Fox’ that you are more then welcome to. Re the introduction, I should have known better. and usually I do as you do. But I’d started reading, and come across a grea slab of the strange invented language that Sam Pollit uses, and was mystified. In the end I was disappointed. Maybe my expectations were too high? The Nigeness Blog? Do share the URL, please! His 1000th post came with a photograph of two handsome pigs on a fence. I skipped over the spoilers bit because I haven’t read it. I started Im Dying Laughing by Christina Stead last week and couldn’t get into it at all. Maybe I should give this one a try instead? I don’t know Becky, it’s rather long (500+ pages in my edition). DKS very kindly gave me a copy of For Love Alone which looks appealing, but really, I’d like some advice from the Christina Stead fans out there in cyberspace who’ve read her oeuvre: what’s the best one to begin with? It depends what you want. The Man Who Loved Children is, I’d say, a much better place to start than I’m Dying Laughing. It’s a book with a much stronger thrust and a smaller direct area of focus: the family. I’m Dying Laughing was a mass of posthumous manuscript pages jigsaw-puzzle’d together by her faithful literary executor R.G. Geering, and the result is sometimes wayward and jerky, or draggy: unevenly paced. The theme — the betrayal and self-betrayal of communist sympathisers in the U.S. during the first half of the 20th century — doesn’t have Man’s easy universality. So: go with Man. Or if you want something lighter than Man — happier, I mean, without the family tension that shapes Man’s story — then The Salzburg Tales might be worth trying. It’s her take on the Decameron — a set of short stories told by visitors to the Salzburg Festival — all bright vividness and brilliant energy. Some of the stories are comedies, some are ghost stories, some are domestic dramas, some are fairy tales, some are mysteries, and so on. Clifton Fadiman thought it was terrific. The Little Hotel is trimmer than most of the rest of her work — perhaps a good place to begin if the effusive language of a book like Man seems overwhelming. For Love Alone might work too, simply because it focuses on the romantic journey of a single character, where a book like House of All Nations (an exhausting tour de force, an amazing piece of work) spends hundreds of pages racing around after a massive cast of men who’re all pelting get-rich-quick schemes around like snowballs. A Little Tea, A Little Chat is a bullish, angry book filled with bullish, angry repetition. I wouldn’t start there unless you’re in the mood for something bracing and you don’t mind loathing your main character. Cotters’ England is grim. I’m going to be presumptuous and assume that you don’t want to start somewhere grim. I could be wrong: maybe grim is fine with you. I keep seeing people online who complain, “Oh, the book I’ve just read was awful, so dour, so grim, I hated it,” so I’m assuming … But, yes: Cotters’ England, grim. Miss Herbert: no: save that one for later. The Beauties and Furies perhaps has too many weaknesses. Seven Poor Men of Sydney ain’t at all bad, a wonderful debut novel with some terrific language-flourishes, the flourishes of a young writer road-testing her skills to see how far she can push and how much she can do. I think it would be a good one to start with, especially if you’ve read Hotel du Lac because they make interesting comparisons. I plan on making a start on The Decameron this year, so perhaps The Salzburg Tales should wait till after I’ve read that. Thanks, Deane, your expertise about Stead is very helpful. Capuchin Classics are supposed to be republishing The Man Who Loved Children this year. I’ve had it on pre-order at Amazon for about six months, and just when it’s due to be shipped, I get an email to say that publication has been delayed. This has happened twice, most recently yesterday! At this rate I’ll be lucky to get it before Christmas! Kim, the BD is out of stock too, I see. I could always bring you my paperback copy (that would otherwise go back to the op shop) when we meet up in September?! Then I hope the noise Franzen is making gives them a kick up the arse, if arse-kicking is what they need. Lisa, thanks for the link. I’ve read over my last post and realised that I left out The People With The Dogs. So. The People With The Dogs. Not-grim. Wonderful writing. Uneven story. It takes place in the city and the country and the jump between them is abrupt. She doesn’t disguise the fact that it’s abrupt, but it’s abrupt. I love the thing but it’s generally considered minor Stead. Read the opening page and if you like the sentence about ginmills and flop-houses then keep going, because there’s a great one in the middle of the book, about a storm. I described the books, in that other post, as if they were made up of nothing but characters and stories and grimness (not not-) but really I don’t think she is: she is language, and the feeling of organic space and amplitude that her language gives you. (This is why I’d say, Don’t Start With Miss Herbert, because the language is dragged back and tightened.) All of her books have something good in them, and although Man Who Loved is the most celebrated, it’s not everybody’s favourite. The US writer Michael Upchurch fell in love with House of All Nations and didn’t think so much of Man. (House was “a holy grail, a talisman, a reference point.”) Saul Bellow, asked to nominate a favourite Stead character, picked Mrs Trollope in The Little Hotel. Fadiman preferred Salzburg Tales to anything else she wrote. Angela Carter had a lot to say about Cotters’ England. So it depends. I don’t think of her as a postmodernist. She isn’t meta, she doesn’t deconstruct, she doesn’t play with the idea of story itself, she doesn’t introduce archetypes in order to take them apart or regard them from the outside … When she calls Henny a witch she’s not asking us to reflect on the idea of the Witch in popular culture (or anything like that), instead she’s using the idea of a witch as mulch, to deepen and expand the reader’s ideas about Henny, giving her the qualities of a witch — she is an outsider, untrustworthy, unpredictable, willing to draw on forces of death and darkness, in opposition to the godlike sun-figure of Sam. True, I think it defies classification. I looked her up on my post which define modernism and post modernism, and there is hyperbole, playful language, intertextuality (all those allusions in that strange language! ), and plenty of black humour. But is she using that language — you mean Sam’s lingo? — to “be intertextural,” or is that just the way her father — the model for the character — really was, in real life — which would make it, for her, realism? The biographies suggest that it was realism. Exaggerated, but realistic. Sunday/Funday was a David Stead invention. The letters Sam sends from Malaya are his invention too: Christina cannibalised them for her book. Hazel Rowley quotes a letter he wrote to his children in 1922: “Luv to evryboddie and all bee goode. Thoes who duz thare dutie ar luvly wuns thay will get some frottie and some kurren bunz. From DadPad the Boald.” She says also: “His own favourite book when he was a child had been Joel Chandler Harris’ Tales of Uncle Remus … and he was adept at Remus-speak … David Stead’s other linguistic model was the American comic writer Atemus Ward.” When Sam launches into his own Artemus Ward impersonation I don’t think Stead is trying to set up a deliberate, reflective interlink between her book and the work of Artemus Ward — she’s channeling her dad into the character. Ah, I can see I need to read the bio! I have it…somewhere! There’s a feeling around postmodernism that she doesn’t have, too — a superconsciousness that comes from an author viewing critically the very process of telling stories to an audience (see: grandaddy Sterne’s shaggy dog story grinning at the reader who expects endings and beginnings). I wouldn’t boast that I’m an expert in postmodernism, or even anything close to it, but to me she seems too far inside the story, too sincere. A pomo author wouldn’t be Charles Dickens writing a disguised-autobiographical David Copperfield, he’d be David Copperfield writing Charles Dickens writing David Copperfield, which, Borges-wise, would have exactly the same shape as the David Copperfield that already exists. But Christina Stead is Charles Dickens writing David Copperfield. Now, talking of PoMo, you absolutely *must* read Glissando! I’ll see if the library can get it in. LOL, quite coincidentally as I hadn’t seen this post I just asked the question in my most recent post about reading Introductions. I never read them first. I think they are misnomers – I think they should always come at the end and be called Afterword! I haven’t read your review properly because I have yet to read this book too (as I think we’ve discussed before). Yes, I usually ignore Introductions too, Sue, mainly because I don’t want to read what someone else thinks about it until after I’ve read the book myself. But as you will see when you read it yourself, Stead’s use of a strange invented language is difficult, and I thought perhaps the intro would give me some clues about how to make sense of it. I think that anything that discusses plot points of any significance should include a warning or be at the end of the book. It’s not hard for publishers to do that, eh? I suspect that in this case the Aussie publisher was a bit over-impressed by having an American reviewer praise the book to the extent that he did and thought it should have prominence. I wish they’d make them Afterwords as well. Yes, I think it must be the same one. What a pity we can’t read all of the NYRB article! Oh no! Darryl, you’ll have to re-schedule the season, this is when I am away overseas! I might be out of the country by then too. Is there a script available anywhere? What are you doing with her work? It looks as if you’re arranging selections from her books into a monologue: true? 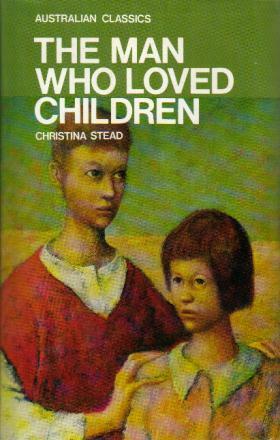 When you say, “To our knowledge, this is the first time Stead has been portrayed on stage, and any of her writings performed,” are you remembering the For Love Alone stage play written by Gillian Berry, and the 1986 film version (and then discounting the play on the grounds that it appears to have been workshopped but perhaps not performed, and the film on the grounds that it’s a film)? I’ll add you to my page of Stead links, anyway, and if I’m in the country I’ll come to the show. Thanks for posting the link. And oh, final question, are you including anything from The People With the Dogs? On another note, thanks for your review! I am a student at Sydney Uni and we have just finished studying TMWLC. Such a fascinating, if seemingly perpetual, read. I’m certainly glad I have now experienced it. Hello LittleEm, it’s lovely to learn that this novel is being studied at Sydney University. Do you get a chance to check out Patrick White as well? Yes, we did The Ham Funeral too which was very interesting.. It was a unit called Australian Texts in International Contexts. Thoroughly enjoyed it. That’s fantastic. I hope you get a chance to read some of his other works too, I’ve just read Happy Valley (his first) and I loved it. Which other AusTexts do you study? Can’t resist butting in here … hope you don’t mind Lisa … I love the sound of this course and the variety of texts you are doing. Hope it was well taught.